I work full time as a freelance translator and conference interpreter. I’ve worked with various clients in Indonesia and abroad on numerous projects to translate documents and websites. My translation specializations are technology and human resources. I’ve also translated texts about education, aviation safety and security, academic, online training modules, agreements, and certificates. 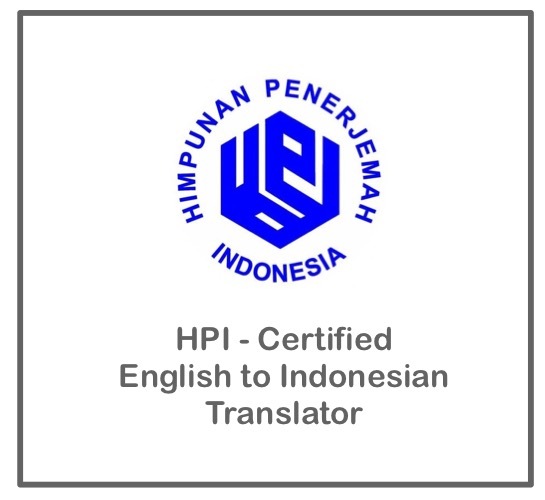 I am a member of Association of Indonesian Translators (Himpunan Penerjemah Indonesia [HPI], a member of International Federation of Translators). Other services that I provide include editing and transcription. I have taken part in many translation and localization projects, and currently a member of a localisation team for a renowned tech brand. Here’s what some of my previous clients think about my work and services. As an experienced conference interpreter, I’ve delivered simultaneous and consecutive interpretation in conferences for the World Bank, UNIDO, WWF, World Culture Forum, Asia Pacific Human Resources Forum, International Cyber Security Conference, and many other events. I am a member of the Association of Indonesian Conference Interpreters (AICI). Further information about my professional experience and profile is available on LinkedIn.